This Bubble Up Chicken Alfredo Bake is the comfort food casserole your whole family will crave this fall and winter. Full of hearty chicken breast, healthy broccoli, tasty biscuits and smothered in cheese and creamy alfredo sauce, what’s not to love? This casserole is simple and easy to make, perfect for a weeknight dinner. I like to make a big batch of shredded chicken in my slow cooker at the beginning of the week and use it in different recipes and this one is a perfect meal for it! For details, check out my Easy Slow Cooker Shredded Chicken recipe here. 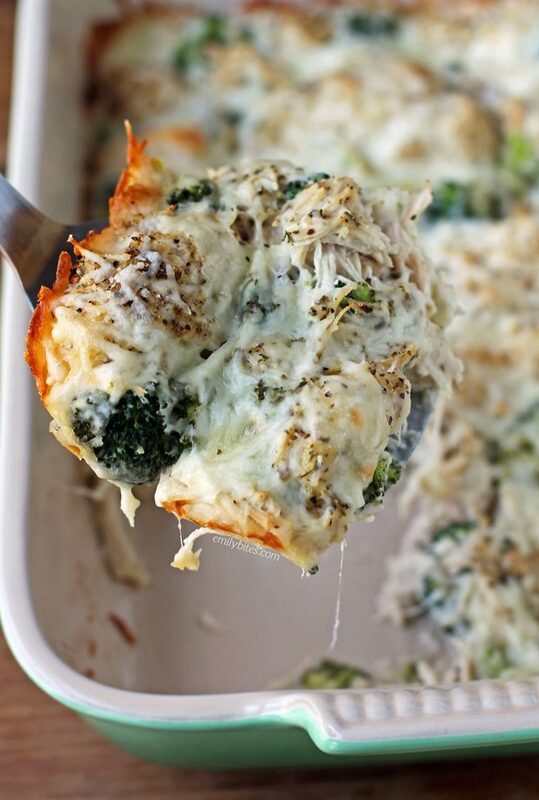 Not only is this recipe easy, a big serving of this Bubble Up Chicken Alfredo Bake is just 286 calories or 6 Weight Watchers SmartPoints. Looking for more easy, lightened up comfort food casseroles like this Bubble Up Chicken Alfredo Bake? Check out my Cottage Pie, Cheesy Buffalo Chicken Potato Bake, Layered Chicken Enchilada Bake, Chili Cornbread Bake, Teriyaki Chicken and Rice Casserole, Bubble Up Chicken Pot Pie Casserole, Chicken Parmesan Quinoa Bake, Cheesy Chicken Broccoli and Rice Casserole, Bubble Up Pizza Casserole, Chicken Cordon Bleu Pasta Bake, Sausage and Stuffing Brunch Bake, Deep Dish Sloppy Joe Casserole, Bubble Up Enchilada Casserole and many more in the casserole section of my recipe index! Place the chicken, broccoli, alfredo sauce, broth, Italian seasoning and pepper in the baking dish and stir together until combined. Add the biscuit pieces and stir in to coat. Bake for 25 minutes. Remove from the oven and sprinkle the Mozzarella cheese over the top. Return to the oven for another 15 minutes until the casserole is hot and the biscuits have bubbled up. Slice into 6 pieces and serve! Can you use frozen broccoli? This looks amazing! 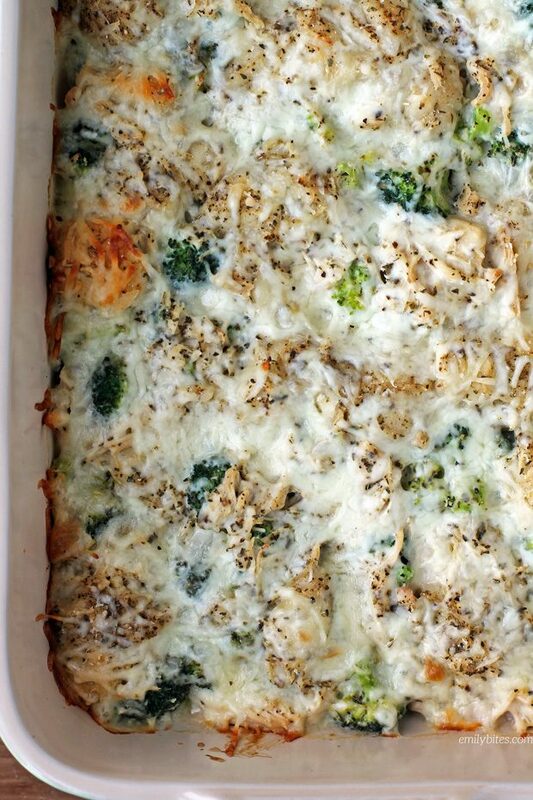 I have not made this using frozen broccoli, but you can certainly give it a try! Totes making this!! If its half as good as your Swedish meatball bubble up we are in for treat! I made this dish last night and it came out great! I used broccoli from a “steamable” bag and it totally worked. I also added mushrooms to bulk more veggies. Thank you for your awesome recipes! Made this for my family tonight. Delicious and so easy. Can you freeze bubble up recipes? Hi Sara, I really don’t freeze anything so I am not the best at answering this question. I’m sorry! If you try it out please report back! This dish is delicious!!! I used spinach in place of the broccoli and it was a hit with my family. Made this for dinner tonight – SO DELICIOUS! I can’t wait to have it again for lunch tomorrow! Absolute deliciousness! Hard to believe I can be following Weight Watchers and still enjoy such comfort food. I’m going to add even more broccoli next time. Thanks, Emily! I love these bubble up casseroles but I always seem to have a problem getting the biscuits to cook (particularly the ones in the middle). Any thoughts on why that may be occuring? I’ve honestly never had that happen! Maybe your oven cooks at a lower temperature? I guess in your case you’ll just know that you have to cook it for a bit longer. Sorry about that! Thanks for the great recipe! This was delicious! I noticed you used a generic listing for alfredo sauce rather than the light alfredo sauce specified in the recipe. That could make a huge difference! Different brands of products can also have different nutrition info and can vary the points. My calculations are made using the exact brands and products I used, so if you use different ones (for example a different brand of biscuits or regular alfredo sauce rather than light Classico) the points may vary. Hope that helps! Do you need to cook the chicken first? Yup, the ingredients specify cooked chicken! I can’t find this in myfitnesspal, I’ve searched for 10m… I see something similar for 499 calories but the protein/carb/fat ratio + calories is wrong 🙁 can you add this? Never mind I just added it myself! Made this tonight and it was a HIT with the entire family! So easy to make too! Keep up the great work Emily! I made this last night and it was amazing!! I used frozen broccoli, but I left it on the counter for about a half hour before adding it to the casserole. Can’t wait to make more bubble ups! This looks amazing, going to make this tonight. One question, the recipe calls for 4 oz (1 cup) of mozzarella cheese. Isn’t 8 oz 1 cup? Just want to make sure I am using the right measurements. Thanks! Can you make this up the day before cooking it? Maybe everything but the biscuits? Thanks and looks delicious! This was absolutely delicious!! As you suggested, I substituted 7.5 oz of Grand Biscuits because i couldn’t find the other kind. Unfortunately, it came out to be 8 points a serving in the recipe builder on the WW app. I keep getting 8 points with the exact brand of sauce and biscuits… I’m confused! Has anyone attempted this with the WW two-ingredient dough? It would make it less points, but I’m afraid to try. Even though we used less liquid and more veggies, it wasn’t dry at all. We loved it! We made another variation last night with spinach, artichokes and water chestnuts and again 3/4 jar sauce and it was also fantastic. Our new go to dinner! Do you fresh, frozen or canned spinach? Made this for dinner last night and it was delicious! Husband said it was one of the best dinners we’ve had in a long time. So easy! Will definitely go into the rotation. I still go by classic WW points and using the ingredients I had it totaled 6 points per serving. This comes out as 8 Smart Points per serving on the current WW plan. It was the hit! Next time adding onion, mushrooms and garlic to it. I did add more chicken and broccoli than was in recipe, added parmesan to the sauce. A keeper in family cookbook for sure!